A boy and a girl sit back-to-back in different worlds, neither knowing of the other's existence nor that they're linked by an invisible story yet to be told. Her name is Vella, stealing a brief moment to herself on the most important—and the last—day of her life. He is Shay: passenger, prince, and prisoner of an overprotective spaceship devoted to giving him everything he wants, except the freedom to finally grow up. Today, both face a rite of passage, and nothing will ever be the same again. But in a nostalgic way, at once familiar and fresh to anyone who fondly remembers point and clicking through the adventures of old. Even before the game starts, there's a lot riding on Broken Age's shoulders—more than most Kickstarted games. It didn't simply have a successful crowd-funding campaign, though raising $3,336,371 so that Grim Fandango creator Tim Schafer could make a new adventure was nothing to sniff at. It was the crowd-funding campaign, the one that established that developers really could put fans in charge of their future—a landmark moment that directly inspired every other revival from Tex Murphy to Star Citizen. This comes with Expectations. While Broken Age isn't the first Kickstarted game to land, it's the one that most has to reward that initial faith. After all, it started a gaming revolution before it was even named. You wouldn't guess any of this by playing it though, and that's for the best. It's not the greatest adventure ever made, but it's not trying to be. It's not self-important. It doesn't bite off more than it can chew in terms of style or storyline, unless you count shooting over budget and having to be split in half for the moment, which does admittedly deserve a sigh. It's happy to be traditional. Comfortable. It's the kind of game that warrants words like "nice" and "lovely" in completely genuine, non-ironic ways. It's about sinking happily into a bed of genre tropes made by a master of the craft, and being wrapped up snug and warm in gorgeous artwork, clever writing, and imaginative design that reminds you why you loved the genre in the first place. At least, this half is. Both are included with the purchase though, with this intro ending at an appropriate and suitably intriguing point that will do for the moment. 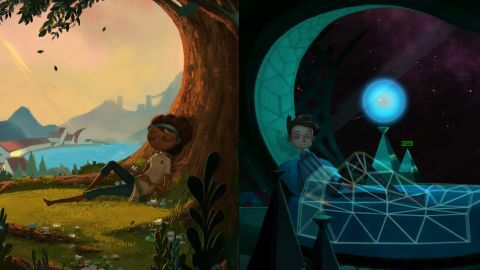 Broken Age's main gimmick is that you can switch between Vella and Shay's stories at will, though their puzzles and stories don't directly connect as you'd expect. They do however both complement and subtly contrast each other in clever ways, like both focusing on their character's need to break free of their childhoods and seize control of their fates. Vella's story however takes the form of a traditional, linear magical journey through a number of worlds, while Shay spends his trapped in one location that can be explored more or less at will—one more overtly built around the classic Three Trials puzzle structure—with multiple tasks to do in no set order. (In practice, Vella's story also repeatedly uses this, though with lots of simple tasks rather than three big ones.) Her world is a fantasy one, his a realm of science fiction, though a warped kind that almost justifies coining the term "nurserypunk." The list goes on. Of the two, Vella's is the more dramatic tale—at least, so far. It's a twist on the classic folk tale image of maidens being sacrificed to appease dragons and other monsters, with the specific monster being a potential Elder God level obscenity called Mog Chothra that regularly descends on an event called the Maiden's Feast to indeed feast on maidens. It's a creepy situation made worse by the way the maidens openly drool over the prospect and fight to be lunch, with their families going so far as to dress them as cupcakes and other tempting treats as if they're off to prom rather than facing their doom. Only a single, guilty line of regret from Vella's mother and her grandfather's disdain for everyone's lack of fight suggests that anyone at all sees a problem with this setup, and even Vella herself is more or less okay with it—at least until Mog Chothra actually puts in an appearance and inspires her to try a new, smarter plan: bail, escape, find a way to kill the damn thing already. Shay's spaceship world is more casual, but manages to be even more unusual. As a character, he reminds me of Adventure Time's Finn, only on the verge of clinical depression after a life of being cosseted by a computer so suffocating that it won't even let him go out in a spacesuit unless he remembers to put on a scarf. Every day is the same, being fed the same food and going on completely artificial "missions" designed for toddlers. An ice cream avalanche. Emergency cuddle deliveries. A spacewalk on a leash so tight, it might as well be to stop him running too far ahead in a garden. When he spontaneously allows himself to fail though, things change—the arrival of a mysterious and not at all suspicious-looking wolf stowaway giving him the chance to go behind his computer mother's back. Finally, he gets to go on a real rescue mission. All he has to do is sabotage the ship, and navigate it to a restricted part of space called "Prima Doom." Sounds lovely. What could possibly go wrong? Both worlds are relatively small, but gloriously realized, with their hand-drawn look and a surprising variety of sprite animation, costume changes and characters. Each part of Vella's journey takes her to a different fantastical setting, including a cloudy realm where snow-shoes are needed to avoid sinking and falling to the ground, and her own baking town. Shay's meanwhile is a mix of high technology and nursery props — his bridge for instance just toys embedded into panels that he's long since realized do absolutely nothing. The writing too is as good as hoped, with Schafer and any other writers on board managing to make light, bouncy dialogue and witty banter sound far easier than it actually is. Few side characters have much screen time, but they use it well. The standout on Vella's side is a furious tree driven to sap-spitting fury at the cruelty of man, to the point of turning a woodcutter into a paranoid recluse. On Shay's, the prize has to go to the always reliable Jennifer Hale turning in another excellent performance as Shay's virtual mother; an ever-smiling sun who is never anything but patient, unflappable, and absolutely devoted to keeping him safe from the dangers of the universe even if it literally drives him insane in the process. The whole cast does a great job though, with even the smallest characters bursting with charm and personality. The one minor disappointment is that Broken Age doesn't offer much in terms of puzzles. It presents amusing ideas and fun results, but absolutely no challenge. Almost everything boils down to using stock inventory objects, and with only a handful of screens and objects, it's usually immediately obvious what needs to be done—even the more involved ones like taking a series of trips through a teleporter for reasons best summed as "don't ask" actively avoiding making it tricky. The result is that even taking time to savor everything, both stories can be easily polished off in just three hours without any real chance of getting stuck, or even getting one of those "Aha!" moments to self-five over embarrassingly. The best classic adventures constantly found new spins on the formula, and Schafer and his fellow Lucasarts designers were no slouches at this back in the day—the physicality of Full Throttle, the freedom of the Monkey Island games, and the time warping of Day Of The Tentacle all coming to mind. So far, Broken Age hasn't even attempted to carve out something similar, though there's still time. I hope the second act has something clever in mind. Whether that happens or not though, this was a good use of that Kickstarter money. Broken Age might not be close to the length and complexity of previous Tim Schafer games such as Grim Fandango and Full Throttle, or an instant classic like just about every Lucasarts adventure not a bad anagram of "Escape From Island Monkey," but it's still a fine reminder of them. And really, that's what should have been expected. Those games were very much products of their time, and in specifically promising to be one rather than update the idea like Ron Gilbert attempted with The Cave, this was always going to be a celebration rather than a modern successor. As that premium-grade nostalgia trip though, it does a fine job. Like a reunion concert of a band you once loved, or a candy shop selling a particular brand of candy that brings to mind childhood summers of sun and sea and all that other cliched crap, Broken Age is a well deserved chance to remember the old days and realize that they're still closer than they might sometimes feel—even if the second part is a little further away than intended.